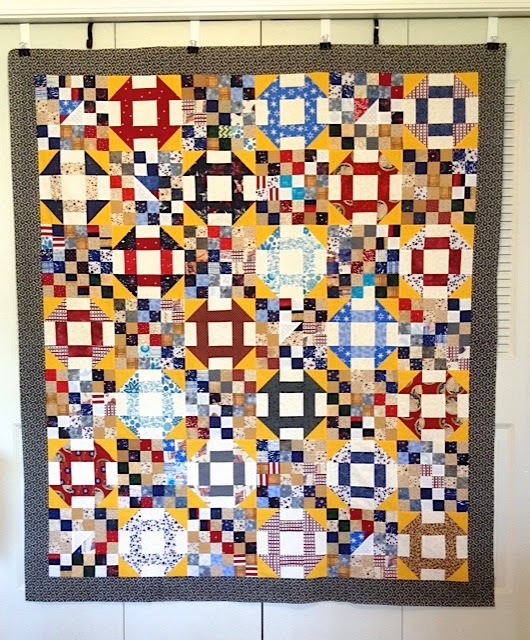 Square Deal is yet another quilt made with scraps from other Quilts of Valor. How many more can I make from the seemingly bottomless bin is beyond me. I hope this simple quilt will comfort a veteran and express my gratitude. In the mid to late 1970s, I travelled to several states for the International Thespian Society, as I was the Regional Director. Previous to serving in this capacity, I was the Wyoming State Director. I wrote about a memorable trip to Muncie, IN with the students in this earlier post. 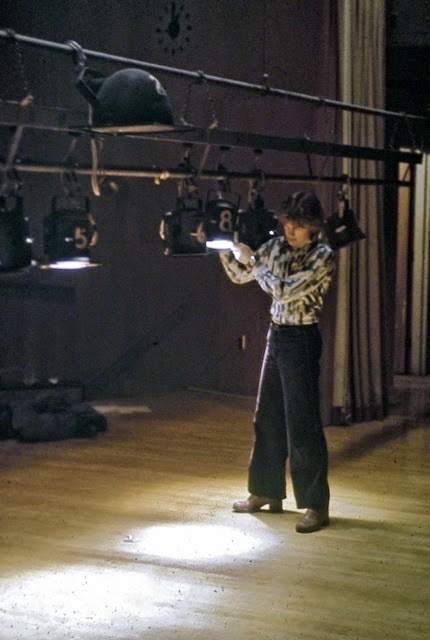 The photo above shows a Montana drama student setting the lights on the stage at the Missoula High School. I was impressed with the facilities and how much the Missoula community supported the arts. Today, the area still has a strong drama community and a traveling children's theater group. The trip to North Dakota's State Drama Festival was memorable because the last day of the event, a severe winter storm was bearing down on the state. I had flown into Bismark, and the festival was about an hour drive north in McClusky. I was certainly glad that I had a driver and that I did not have to attempt to find my way in the storm, as the snow was thick driven by the wind, making the road difficult to see. During the two years that I served as the Regional Director, I saw many talented young people perform and some extremely dedicated directors. 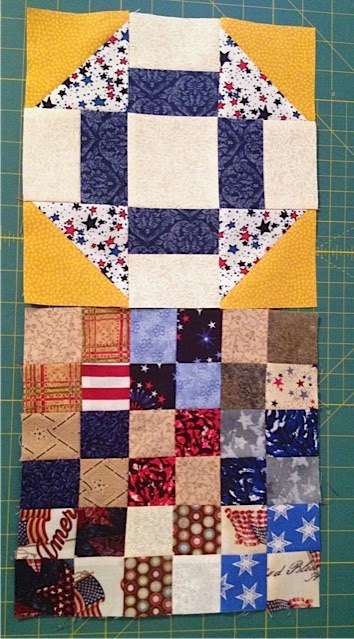 Four blocks left over from yesterday's quilt, Scrappy Stars, made another Quilt of Valor quickly possible. 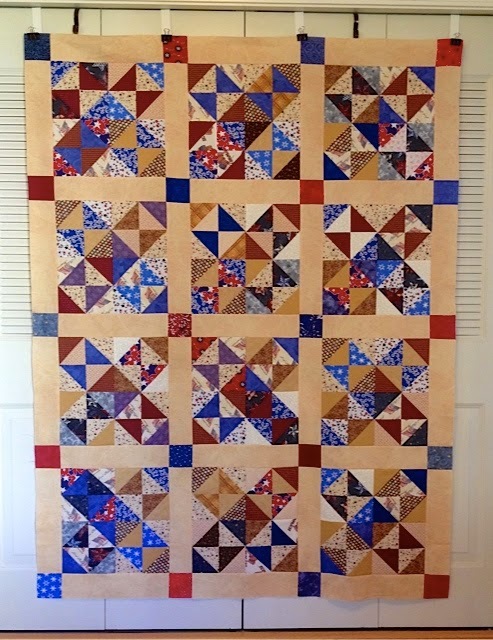 This one is a personal favorite due to the deep, mottled red that frames the stars and the antique beige with red cross-hatched fabric that pulls it all together. Yet another attempt to reduce the scraps that have been accumulating the last four years. 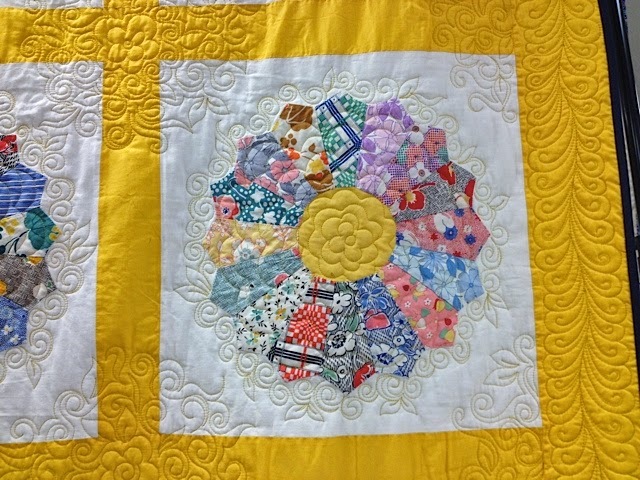 Everything on this quilt but the sashing is from the scrap bin. The block I used is called Broken Dishes - I used 4 inch squares to make the half-square triangles (HSTs) used in this quilt. The large blocks are 14 inches finished. 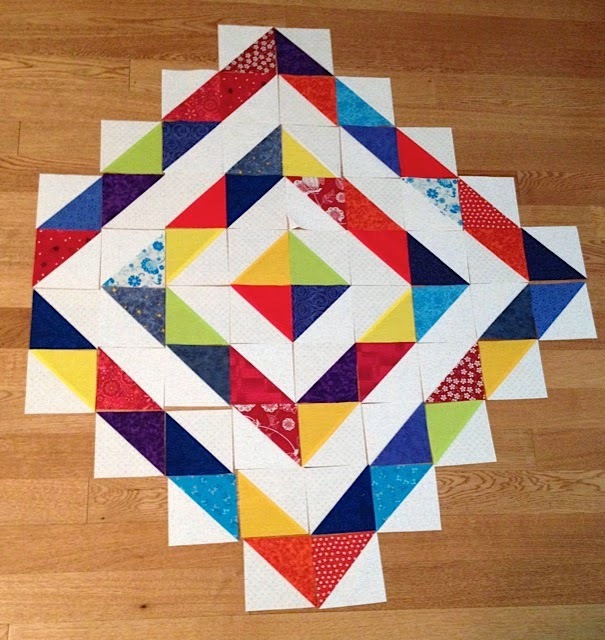 The app BlockFab is a wonderful tool for quilting. It helps size a block from 1 - 38 inches, gives cutting directions, as well as suggests blocks with which to set the blocks. It is an extremely helpful tool, but unfortunately it is only available for the iPhone. If more Droid users become aware of the app, they might encourage the designer to make it available for them, too. 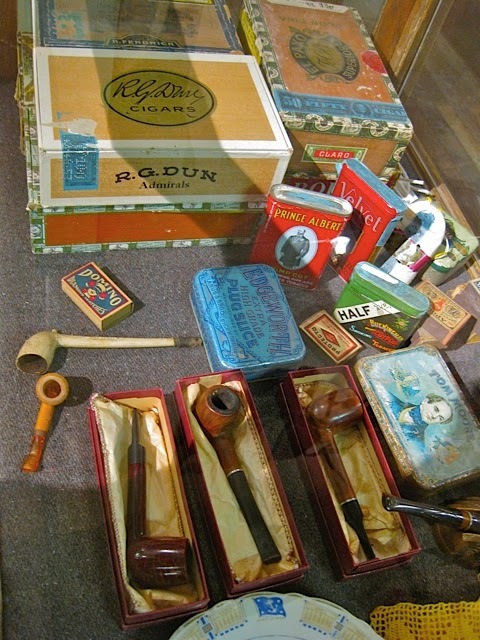 My father and brothers smoked cigarettes as did my maternal grandfather. Grandpa Eberle always used a long cigarette holder when he smoked. I never did know why. My Dad rolled his own cigarettes for years. 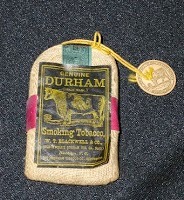 He smoked Bull Durham which is the white bag behind the Velvet tin in the photo. He would often close the small bag by holding one of the golden strings in his mouth. Later he smoked Lucky Strikes. I never did see him smoke a pipe or a cigar. My oldest brother John smoked Marlboro, and Rich smoked L and Ms. Rich sometimes smoked a Tiparillo, which is a small cigar with a plastic tip. As you can tell, I was surrounded by second-hand smoke as a child and a teenager. My mother did not smoke and neither did either of my sisters. I don't know if tobacco played a role in the early deaths of my father or brothers, but I'm sure it contributed a great deal. Friday morning, as I was cleaning off the cutting table in my sewing room and organizing the box of scraps, I found a zip bag with some colorful half square triangles (HST). These HSTs were the "waste" cuts from the large flying geese on the quilts Come Fly with Me and Fly Away Home. The HSTs were calling me to "play" a bit, so I did. As you can see, on the far left, I needed two more HSTs to complete the point. In a flash, I had two more HSTs and began sewing these bright pieces into a baby quilt. Didn't it turn out cute? 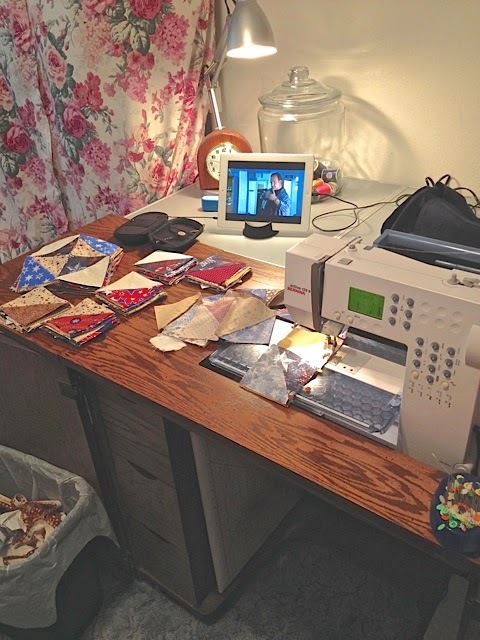 My sewing room (aka the Sweat Shop) has been open for business several nights the past week as I worked on reducing the scraps that have been accumulating since I started making Quilts of Valor four years ago. Often I will lose track of time as I stitch. Last week, I missed a meeting because I was distracted working on Country Crossroads. As you can see, I watch movies on my iPad via Netflix as I sew. Last night, I watched K-911. It was fun to sew as Jerry Lee and Dooley solved crimes. Sometimes, I listen to iHeart Radio instead of watching movies or television shows. I've been a more productive knitter and quilter since I cancelled my cable TV subscription. Not counting the black border, this quilt has 1,107 pieces - lots of seams. An earlier post shows some of the process involved in making this quilt, from scraps and a bit of new fabric. 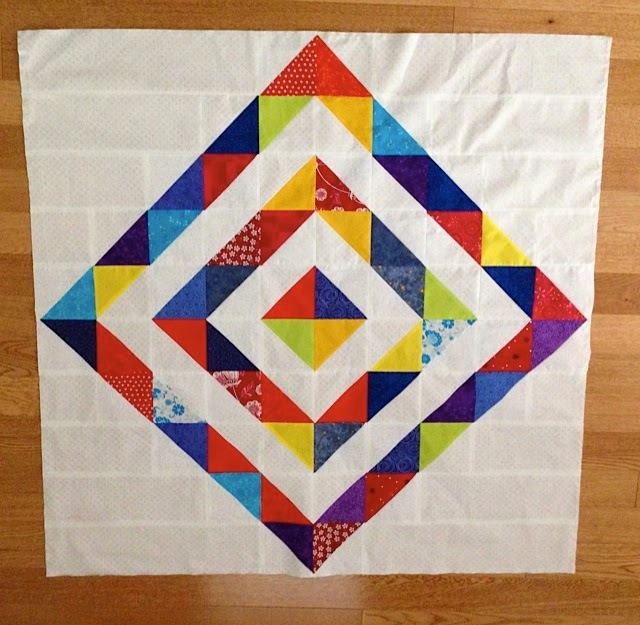 I like how the yellow HSTs combined with the 36 patch blocks create a lattice. 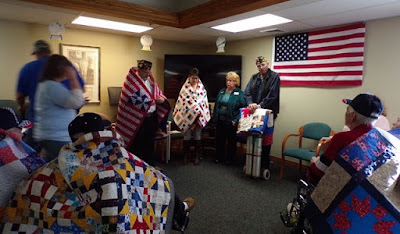 Country Crossroads (shown bottom left) was awarded to a veteran at a local nursing home. It seems like all I've been doing lately is working with scraps. These "four-patches" helped to tame my the bag of two-inch strips. I didn't have a clue what to make with them, but I decided to combine them into larger blocks of 36 patches. 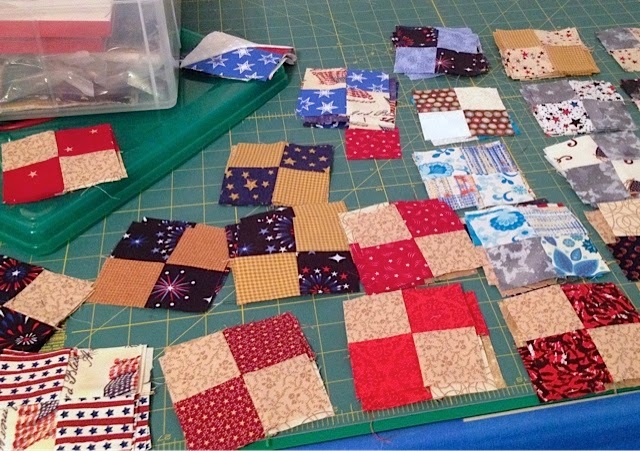 I made 24 of the 36-patch blocks that will finish at 9.5 inches once they are sewn together. 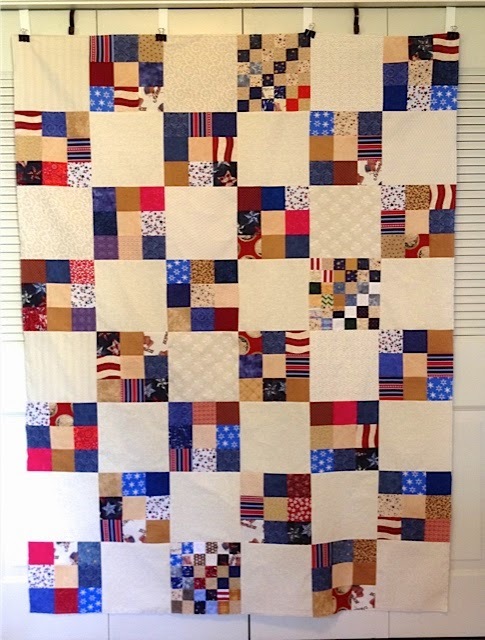 When the 36 patch blocks were finished, I made 21 "churn dash" blocks, and the two will be used together in a Quilt of Valor that will hopefully be finished by next week. My sister, my niece and I went to Dubois last week to the annual Never Sweat Needler's quilt show. A lot of the items of display this year were small, but a couple of large quilts caught my eye. 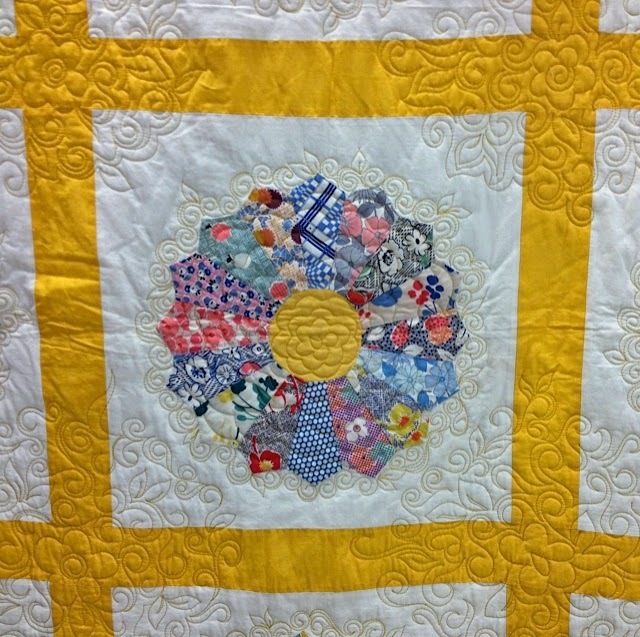 I was particularly drawn to a vintage, Dresden Plate quilt. 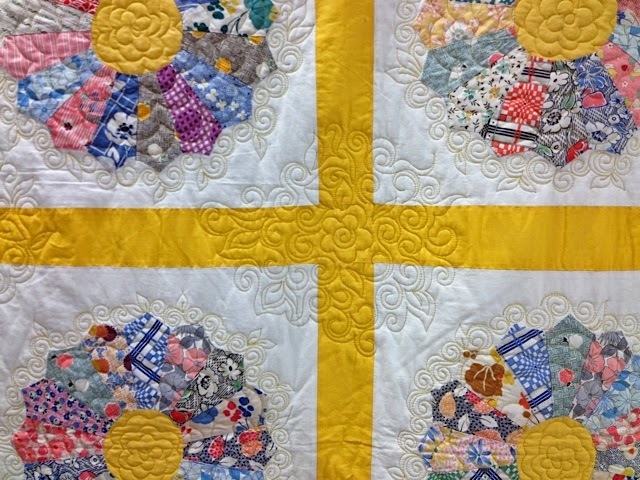 The blocks, made by an unknown quilter sometime in the 40s or 50s, were all hand-pieced and then stitched to the background fabric. The woman who acquired the blocks did some minor repair and then let the longarm quilter add her magic to the blocks. I love the lacy edge around each "plate" and the additional lace where the sashing intersects. 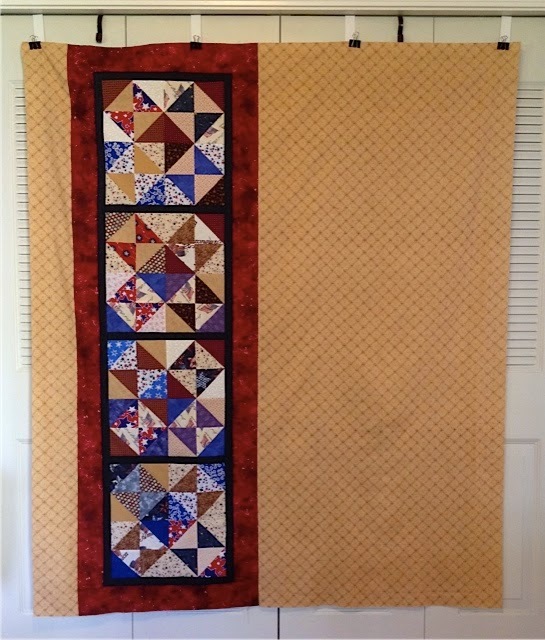 The quilt was finished with "feathers" in the outer border. This time of year always takes me back to the days of preparing lessons and informational handouts for my students. Thankfully, technology has made it easier for today's educators to prepare lesson for their classes. In order to have multiple copies of worksheets and information for my students, I used a ditto machine from the early 70s to nearly the late 80s. 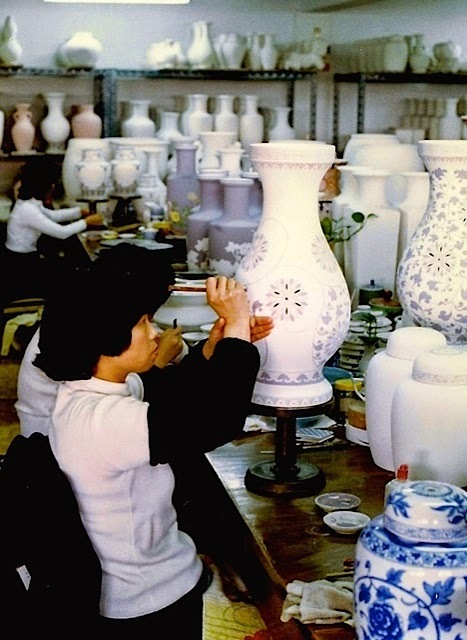 The machine was notorious for jamming if the ratio of duplicating fluid was not matched correctly to the speed of the turning drum on which the ditto master was secured. Many times, the sheets would come out blurry and quite damp. I can still vividly recall the smell of the duplicating fluid. The first machines I used were hand crank, but eventually, the school(s) replaced them with electric ones. The ditto masters were messy to prepare. 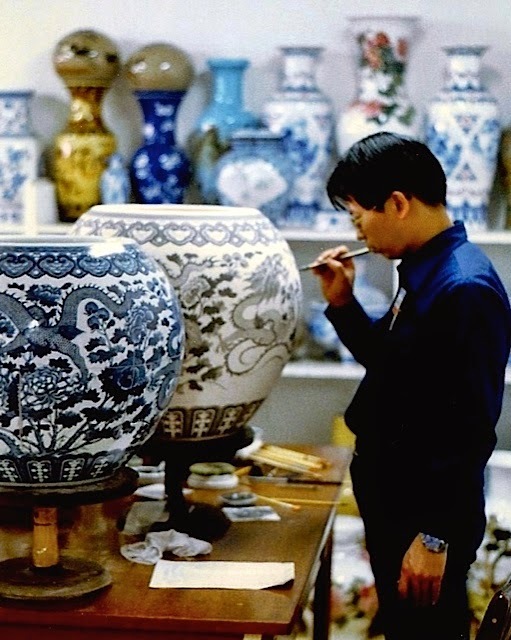 I often would write on the master rather than type because any error or mis-strike on the typewriter required scraping of the thick blue material off of the white base. Sometimes I resorted to cutting out the error with a razor blade or covering the error with Scotch tape. Nonetheless, the blue gunk would ultimately end up on the cuffs or front of my blouse and on my hands. Another machine that was used in the late 70s was the Thermofax. This allowed a ditto master to be prepared from a plain piece of paper. The document was placed inside a special sleeve and fed through the machine which burned the document on a thin master that could then be used on the ditto master machine. 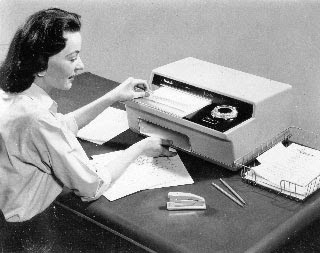 The Thermofax also could be used to prepare transparencies for the overhead projector. Because it was more expensive to use the Thermofax machine, teachers were encouraged to use the ditto machine instead. While more convenient to use, the copies were not too sharp on the master created by the Thermofax. It wasn't until the early 1980s that photocopy machines were widely available in the schools where I taught. Even then, because of cost, the use of photocopiers was discouraged, and the mimeograph was used until nearly the mid to late 80s. 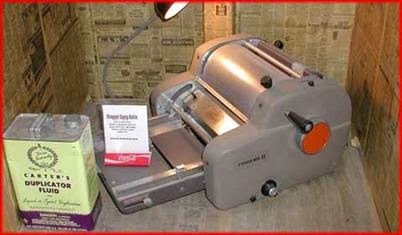 Another machine that was used to print higher quality copies was the mimeograph machine. 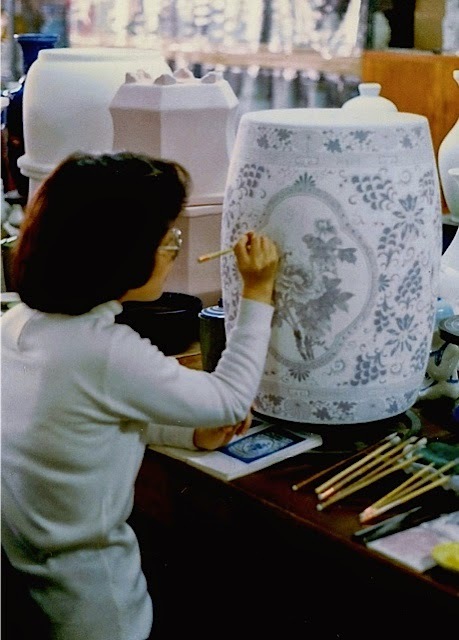 The stencils used in this machine were longer than a ditto master, and any errors were corrected with a correcting fluid. A stylist could be used to add larger fonts or numbers. This type of machine was usually used to produce school newsletter or newspapers and/or brochures. Do you remember ditto masters, mimeograph or Thermofax machines? 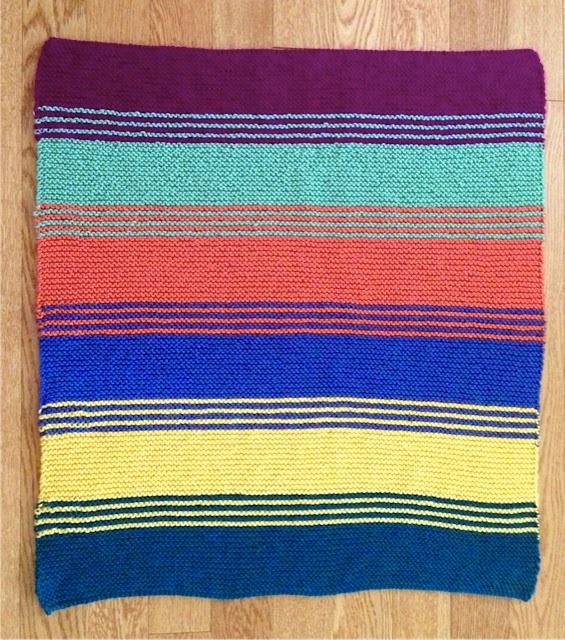 Simply Stripes is off the needles. Specifics can be found on this earlier post. I loved working on this baby blanket while sitting on the back deck surrounded by the sound of birds chirping in the trees. 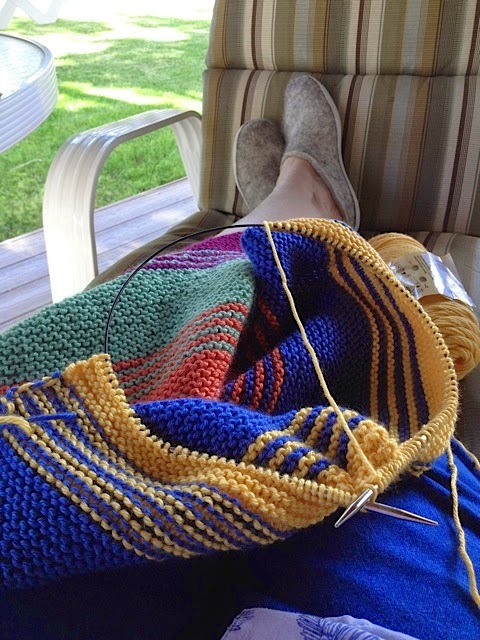 What is your favorite location for summer knitting? 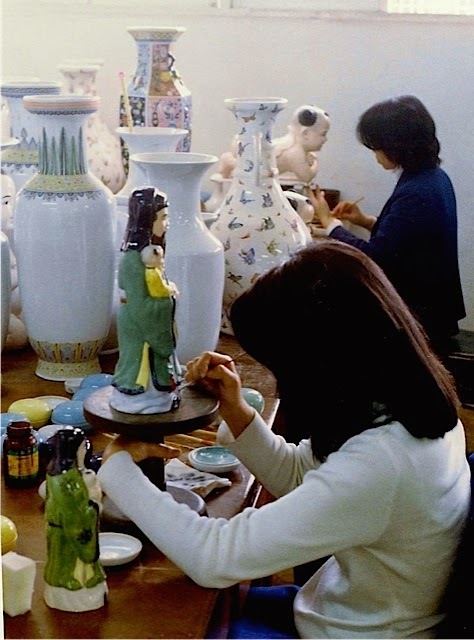 None of the pieces of pottery in this factory were mass produced : each piece was painstakingly, hand-painted. Note the book in front of the artist being used as a reference to the design. You Can Bank on It. 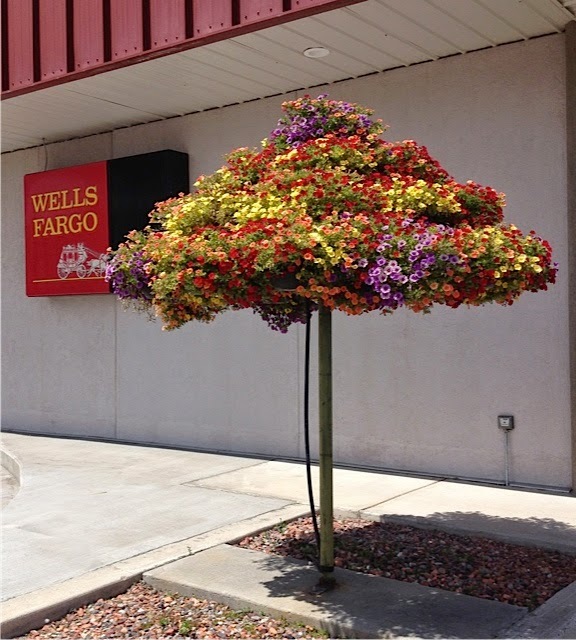 . .
Every year, I admire the flower tree at the Wells Fargo bank. It is doing well this summer due to the moisture and a majority of cooler temperatures this area has experienced. The flowers will continue to thrive until a hard frost, typically in mid-September. I wish the bank would invest in silk poinsettias and create a winter display, but the winter wind would probably blow them away. I posted this flowering display in 2009, but I like the colors of the flowers in this year's display better than those in 2009. Which "tree" do you like? 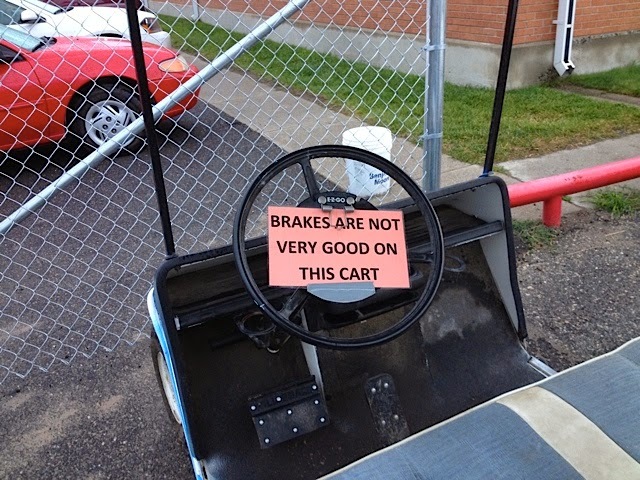 I sure hope this cart has an anchor or some other means of stopping it! Political signs have been appearing everywhere since early Spring. 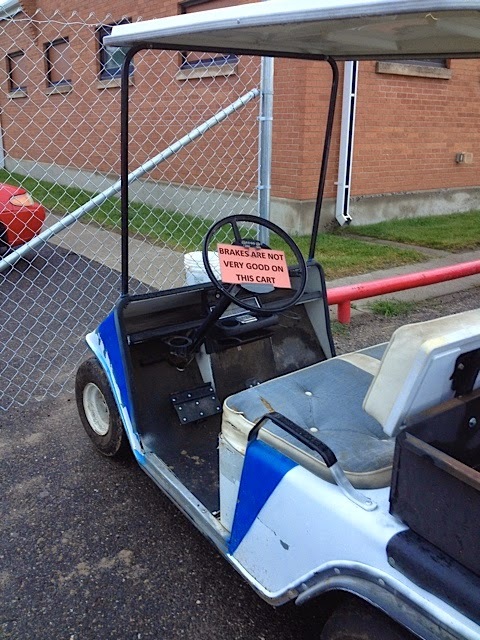 They are on the sides of buildings, on street corners, on the open prairie, propped on hay bales, and taped to vehicles. The signs are so commonplace that it takes something really unusual to catch my attention. 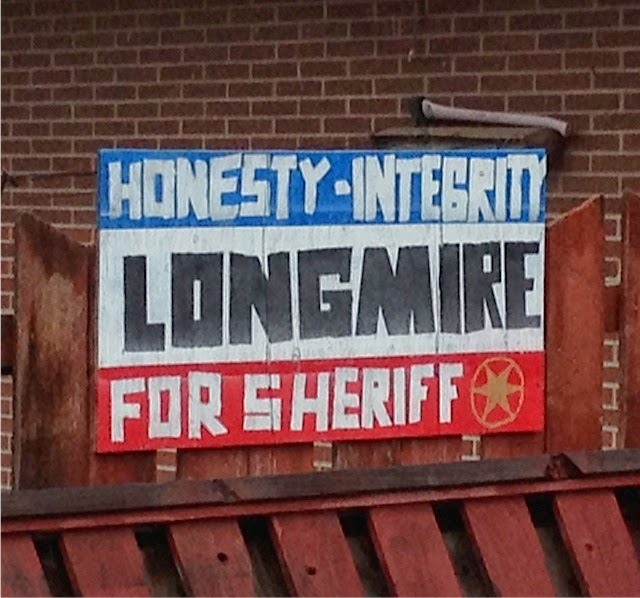 Last week out of the corner of my eye, I spotted the simple Longmire sign attached to a fence on Sunset. If you aren't familiar with Walt Longmire, you can read about the books and TV series here. Longmire's creator, Craig Johnson, lives in Wyoming, so Wyomingites are particularily proud of the series and the books. The Fremont County Sheriff's office is up for grabs this year, and two qualified candidates are vying for the position; however, both are in the same party, so the primary election will eliminate one of them. 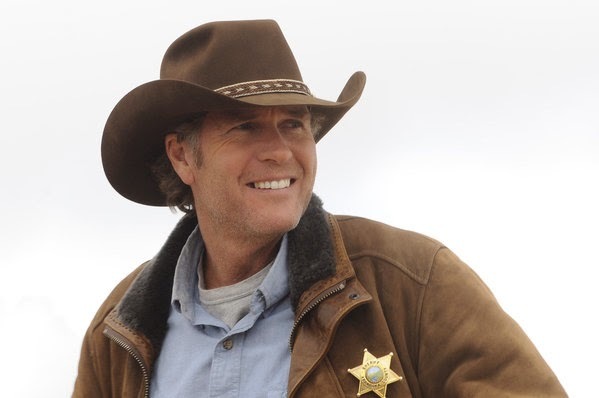 I have no doubt that if Walt Longmire's name was on the ballot, he would garner more than his share of the votes. Have you read any of the Longmire books or seen the TV series? 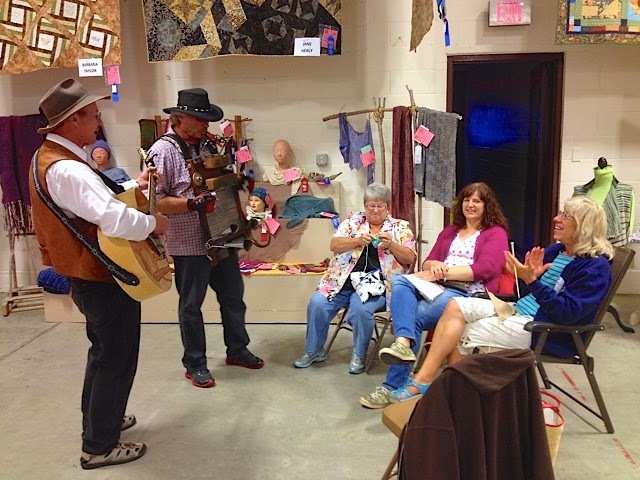 Last Tuesday evening, members of the knitting group met at the County Fair to knit in the Fiber Arts exhibit area. We were surprised when two musicians wandered by and agreed to perform for us. The gentleman with the guitar, improvised a knitting song - such an unexpected and delightful treat. The other gentleman sang about wanting to be a tomato - more laughter and foot-tapping music. 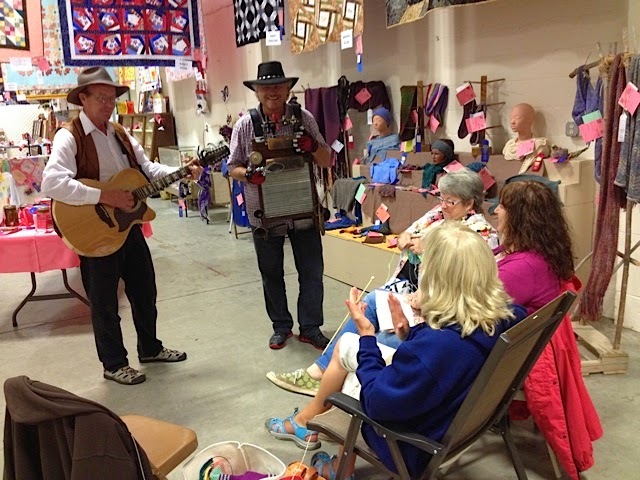 These two musicians live in different areas of the country but have travelled and worked county fairs together for several years. They clearly enjoy life and enjoy making others happy, too. This was probably the most fun we've had in all the years we've met at the fair to knit. Have you had any pleasant surprises this summer?